Assemble your gear before cleaning a linoleum floor. Fill a bucket, or in this case a large bowl, with as much vinegar as you think you'll need to clean the linoleum. 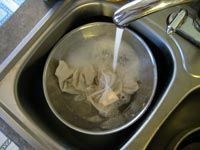 Soak your cloth rag in the vinegar and wring it out so it's damp, not dripping wet. Now this is the hard part: I want you to push the mop back and forth over the linoleum to the beat of your favorite music. There shouldn't be much waiting before you can use your linoleum floor again. Does cleaning a linoleum floor with vinegar actually disinfect and bring out the natural shine of your linoleum? Cleaning linoleum floors should not be confused with cleaning vinyl floors. Vinyl floors are usually 12″ x 12″ squares of solid material that are laid down in patterns. You see this a lot in older institutions. Vinyl can handle a lot more wear and tear than linoleum, which is why I’m going to teach you how to clean linoleum floors without the use of harsh or toxic cleaners. I chose vinegar as a natural linoleum cleaning agent because according to Forbo Industries Inc., a leading manufacturer of linoleum, high pH (base) cleaners and abrasives will damage a linoleum floor, eventually causing it to crack and loose its luster. Ammonia, comet, and most floor cleaners are made from base chemicals. Base chemicals are considered most effective because they literally dissolve the dirt and grime..but also the linoleum floor. Vinegar should be used to clean floors because it’s cheap, natural, and it causes no damage or corrosion to the linoleum floor. Assemble your gear before cleaning a linoleum floor.What we’ve got here is a large bowl (or bucket), a cotton cloth, an old “Swiffer” mop thing, and some apple cider vinegar (5% acidity). 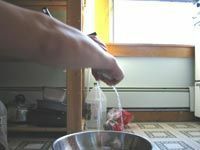 I chose to use a large mixing bowl to keep the vinegar in because the extra width prevents spillage, and later on I can simply wash it out in the sink with some organic dish soap. 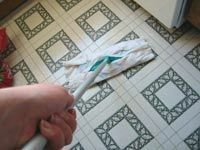 The Swiffer mop is a really great thing without the cleaning pads because you can easily attach a cotton cloth soaked in vinegar instead, and you’ll save a few years on your lower back too. 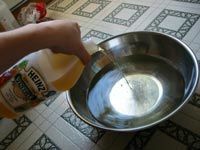 Fill a bucket, or in this case a large bowl, with as much vinegar as you think you’ll need to clean the linoleum.You can dilute the vinegar with water if you choose. The amount of vinegar you choose to clean your floor with depends largely on your sense of judgment. Is your linoleum floor really dirty, or are you just giving it a quick mop? Vinegar only has about a 5% acidity content, so don’t worry about doing any damage to your floors with it. 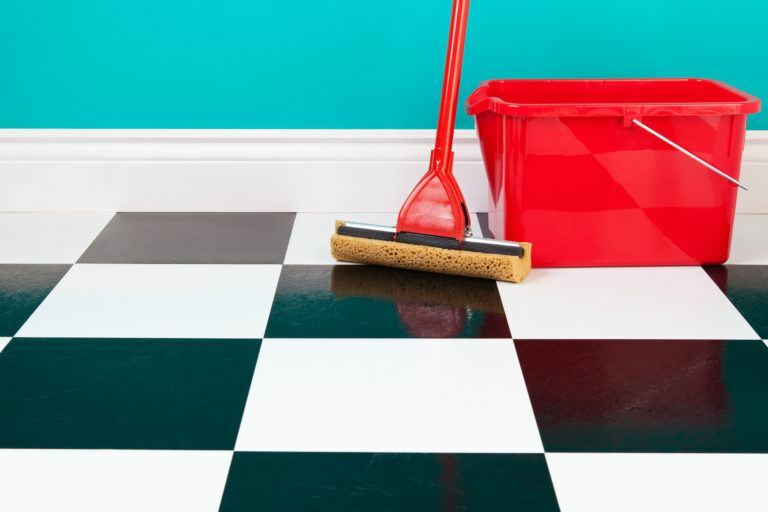 The great thing about vinegar is that you don’t need a lot of it to clean a linoleum floor because linoleum isn’t porous, so it doesn’t soak up your cleaning solution. It’s all about frugality in our home. Soak your cloth rag in the vinegar and wring it out so it’s damp, not dripping wet. 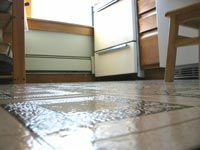 A lot of linoleum floors aren’t sealed properly at the edges, so it’s best not to let the vinegar pool up and risk soaking the carpet or letting it seep into the surrounding floor boards. This is very true for us because our linoleum is right next to an unsealed hardwood floor, so it’s best to just keep the rag damp. 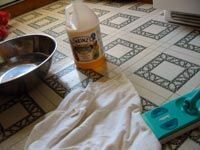 Besides, linoleum is so easy to clean, you don’t really need anything more than a damp cloth and a little elbow grease. Nothing says “non-toxic” like a little elbow grease. Now this is the hard part: I want you to push the mop back and forth over the linoleum to the beat of your favorite music. Seriously, you shouldn’t need directions for this step, but I’ll tell you something. Go over the whole floor once to kind of loosen things up a little, then go back over it with a bit more pressure to make sure you really get some of that sticky stuff off the floor. After that, I usually go back over it lightly, just to make sure—I’m a little OCD. Take the cloth off, mix it around in the vinegar, wring it out, and reattach it as often as you think you need to. There shouldn’t be much waiting before you can use your linoleum floor again. Now, because I used a large mixing bowl to put the vinegar in, I usually move on and do the rest of the dishes as well. I don’t usually bother laundering my cotton cloths because they’re cleaned just as easily if I let them soak in the sink while I do the dishes. Then I wring it out really well, and hang it on the faucet to dry. Of course, if you’re not comfortable mixing your dirty dishes with your floor stuffs, you can always use a bucket and launder the cotton cloth. Does cleaning a linoleum floor with vinegar actually disinfect and bring out the natural shine of your linoleum? You be the judge. No one can object to the fact that linoleum is a convenient flooring alternative to more expensive types of flooring like vinyl, slate, and marble. That’s what makes linoleum so popular. And according to many industry websites, linoleum is made chiefly from organic materials and is hypo-allergenic; these are good things to have in a flooring material. I wasn’t convinced, so I did some research. As it turns out, linoleum is made from linseed oil (hence the name), pine tree rosin, wood flour, cork flour, limestone, jute, and a range of pigments. According to greenfloors.com, linoleum is particularly “green” in its attributes because the production/recycling process of linoleum is almost a closed system. That is, the energy created by incinerating linoleum (if people choose not to recycle it) is almost equal to the energy it takes to produce new sheets of linoleum. Huzzah for green choices without sacrificing quality! Many of the linoleum flooring alternatives, like Marmoleum, are made from natural materials as well. 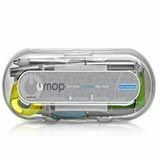 Method now makes a really cool ergonomic and organic floor cleaning solution called oMop. The fabric of the mop is a microfiber cloth, which is great for picking up the very smallest particles and most difficult liquids. The great thing about microfiber cloth is not only their amazingly absorbent properties, but the fact that you can wash and reuse them, instead of throwing toxic waste (ie. Swiffer pads) into the garbage. All of the soaps that come with the Method oMop are non-toxic, just like all of their other products. 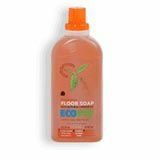 Ecover makes a pretty good floor soap, too, which can be used on anything from marble to tile to linoleum to wood. You can order Ecover from Amazon.